Hot on the heels of Psycho Pass' second season comes Psycho Pass: The Movie. But as a movie that builds yet another layer to the franchise's lore and catches up with some old familiar faces, it is less the completion of the final picture and more just another piece in the puzzle—though an interesting one to be sure. 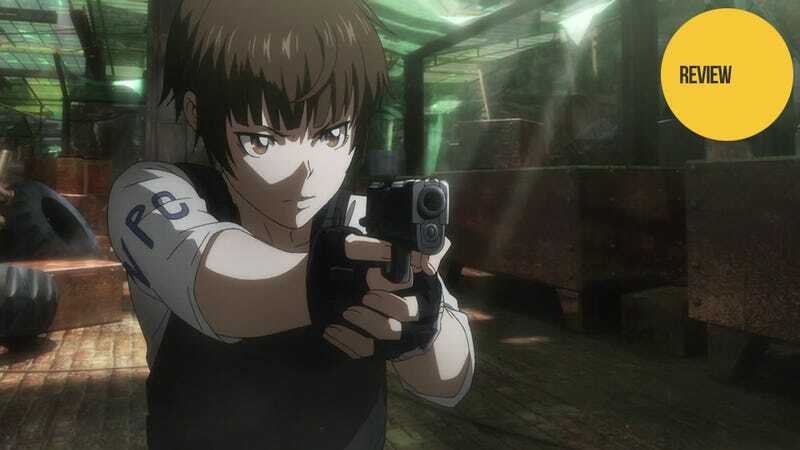 Psycho Pass: The Movie once again follows inspector Akane Tsunemori and is set two years after the end of Psycho Pass 2. After an attempted terrorist attack on Japan by foreigners, Akane learns that the apparent leader of the terrorists is her old partner, Shinya Kogami. Determined to find out the truth, and ideally bring Kogami back into the fold, Akane heads to the Asian mainland which is currently in the midst of a civil war. On one side are Kogami and the guerrilla rebels; on the other, a new paradise city built off the coast that is under the control of the Sibyl System. Far from her home and outside of the urban utopia of Japan, Akane must find Kogami and uncover the mystery of the terrorist attacks—as well as Sibyl's plans for its new country. It is in this new setting we are able to see not only how both Kogami and she have changed over their four years apart but also how readily each can adapt to unexpected circumstances. As the movie opens in Japan, we are able to see that the worst conflicts Japan is facing no longer come from within—e.g., Makishima and Kamui—but from without in the form of terrorists. Moreover, the System inside Japan has begun to expand its purview, now going as far as to suggest compatible partners for marriage—and turning out to be correct in the instance we witness. So with apparent peace continuing in Japan, the Sibyl System has begun to expand outside of Japan to war-torn Asia and has built a Tokyo-like floating city off the coast. However, as it is located in an overpopulated warzone teeming with violence and poverty, few are the people with a psycho pass under 100. Moreover, there is a need for soldiers—and the horrors of war obviously do terrible things to a person's psycho pass. Thus with a manpower shortage and the impracticability of imprisoning all those with a high psycho pass, those under the 300 lethal limit are allowed into the new “utopia;” but if they are over 100, they must wear collars at all times that continuously scan their psycho pass. They are killed immediately should their readings get too high. This has led to a servant class in the new city. They can get only the crudest menial jobs (if they can find any work at all), can't ride the same public transportation as the “clear” population, and are automatically assumed to be the perpetrators in any conflict. Even with all this, it's clear: Most are perfectly happy with this arrangement as it gives them peace and safety far beyond that in the world outside. It's disturbing, even as it makes sense, and watching Akane struggle with the moral and ethical implications of this new city is one of the most interesting parts of the film. When it comes down to it, Psycho Pass: The Movie is really all about the consequences of Akane's actions over the past two seasons. In the first season, she learned the truth about the Sibyl System, yet did nothing—allowing it to spread outside of Japan. Beyond that, she let Kogami escape at the end of the series, leading to him being a key player in the civil war. In a very real way, everything that happens in the film is more than a little Akane's responsibility. Thus, the film focuses on how she tries to set things right without dooming even more to suffering. [Skip to the next section to avoid spoilers.] But more than anything, this film’s story is the result of Akane's actions in Psycho Pass 2. At the end of that series, Akane and Kamui forced the System to broaden its horizons—to judge a society as well as an individual. The obvious problem with this is that a society can be evil while the individuals within are largely good, normal people. However, this film takes the opposite position: that evil people—people the System would kill on a person-by-person basis—can be used to create and manage a good, peaceful society. Thus, once again, it all falls to Akane to be the System's conscience—the one to judge and tell it when it has gone too far. And just as in the past two seasons, the most intriguing thing is that the System listens to her and acquiesces. All in all, while he is a main character, this film is not Kogami’s ending, but rather his epilogue. It interesting to hear about his life after the events of the first season and how he became a valuable asset of the rebels. It's also more than a little interesting to see him fighting the System he once loyally served—even as he worries that he has become the very man he hated and killed. It also provides closure for Ginoza, the other remaining member of Akane's original unit with a close relationship to Kogami—an appreciated touch as his development was largely static for the second season of the anime. [Skip to the next section to avoid spoilers.] And even though she is only in a few, short scenes, it is Mika, Akane's partner, whose development may be the most striking. She now seems comfortable being the System's dog, willing to do anything the System commands—up to and including lethal torture. Moreover, her disapproving attitude and frustration over Akane's more unorthodox actions has become one of blatant condescension. And surprisingly, neither Akane nor the rest of her team are blind to the growing tension between the two—even as they are all forced to work together. If you are expecting the “the movie” to be the definitive end to the Psycho Pass narrative, you are going to be more than a little disappointed. While it is a great epilogue for certain characters and deals with the fallout from both seasons, it is far from an epic grand climax to everything that has come before. Make no mistake, the events of the movie are meaningful and further the franchise's over-arching plot, but the impact these events are likely to have on Akane, her team, and Japanese society in general in any subsequent Psycho Pass stories is minimal. Psycho Pass: The Movie is a decent film and one that does a fairly good job of exploring the consequences of the two seasons of the anime. As usual, the big star of the film is the setting—and showing just how much worse the Psycho Pass dystopia could become is a great reminder of the overall stakes. Moreover, to those invested in the characters, there is a good amount of time spent on Kogami—and subsequently his relationships with both Akane and Ginoza. So really, if you're already a fan, you'll likely enjoy this film. However, allow me once again to state that you should not go into this one expecting the end of the saga. All in all, this film is just another solid stepping stone on that road. Psycho Pass: The Movie was released in Japan on January 9, 2015. It has been licensed by Funimation for an international release, but no official date has been announced.